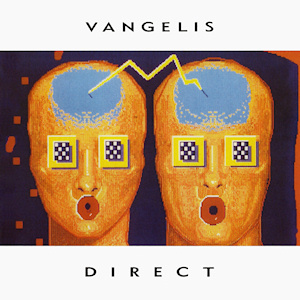 Direct is a 1988 album by the Greek synthesizer artist Vangelis. The album marks a new development in Vangelis’ music, employing a somewhat more popular format. After Mask (1984) and Invisible Connections (1985) there was a brief pause of album work, during which Vangelis moved his creative base from London to Greece, and was involved in theatre work. The album sleeve mentions that Vangelis called the album “Direct” to reflect his way of composing, in which the process of composition and recording occurs simultaneously, with few overdubs. This process was largely facilitated by the use of custom midi performance systems designed for Vangelis by technicians Bill Marshall and Pete Kellock, as well as the commercially available Zyklus MPS which was also developed by Marshall and Kellock. According to the sleeve, Direct was to be the first of a series of albums along the same musical approach. The album is almost completely instrumental, employing mainly synthesizers and drum machines. Operatic vocals on “Glorianna” are performed by the Greek mezzo-soprano Markella Hatziano (uncredited). The male narrative on “Intergalactic Radio Station” is performed by technician Casey Young. A bootleg featuring pre-mix versions of some of the tracks on the album is also known to exist.